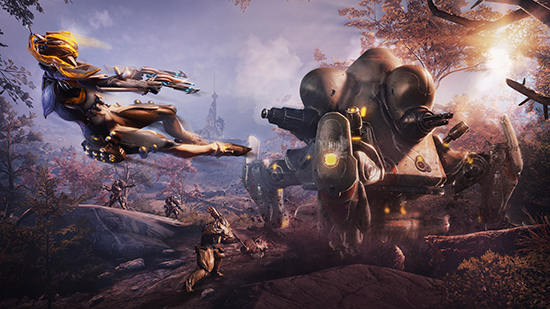 Canadian developer and publisher Digital Extremes has renewed its commitment to Warframe’s breakthrough open-world Landscape, Plains of Eidolon, with a full graphical overhaul available today on Steam PC. Retrofit with the graphics technology created for last fall’s Landscape Fortuna, Plains of Eidolon Remaster delivers dynamic lighting, textures and atmosphere, resurfaced terrain for better K-Drive Hoverboard action, and introduces conservation and a new Grineer menace, the wily Tusk Thumpers. Plains of Eidolon Remaster is free on PC today. The graphical overhaul will enhance every visual aspect of Plains of Eidolon Remaster. Warframe’s open world will see advanced lightning techniques that bring brilliant lighting and shadow changes to the day-night cycle, sending god rays through more detailed trees, bush and fog, and will add crisp new texture details to the foliage and earthen landscape. New terrain also provides more gameplay! For the K-Drive, players will experience new terrain to jump off and grind on, and they should keep an eye out for the new Tusk Thumper enemies, three different pneumatic ground-pounders that smash anything in their way as they crawl and leap across the Plains. Tenno can now earn a new badge for hunting and conserving three new animals on the Plains - previously only available on Fortuna - and special Floofs with which to decorate their Orbiters. Look to download Plains of Eidolon Remaster on Steam PC for free today, and on consoles soon.